The Texas Association of Business wants the state to withhold some money for community colleges until graduate rates rise. The group has even put up billboards to encourage support. KERA's Bill Zeeble reports the Dallas County Community College District says the business group doesn't know the whole story. 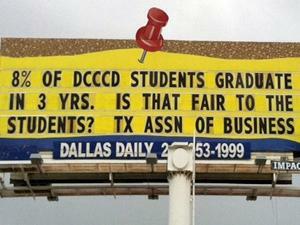 A new billboard on Central Expressway reads "8 PERCENT OF DALLAS COUNTY COMMUNITY COLLEGE STUDENTS GRADUATE IN 3 YEARS. IS THAT FAIR TO THE STUDENTS? It's signed by the Texas Association of Business. TAB president Bill Hammond says he was surprised by that number, especially since Dallas County's Community College students seek 2-year degrees. Hammond says Texas employers need more and better-educated workers faster. He wants to shame Community College leaders into raising those rates by at least 10 percent. Hammond: If they do that we'll meet our goal of having 60 percent of Texans over the age of 25 having some post-secondary degree, certificate, or diploma. To that end, Hammond wants to tie some state Community College money to increased graduation rates. Hammond: What we need is a higher return on the investment that the tax payer is making. 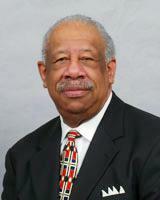 Dallas County Community College District Chancellor Wright Lassiter calls Hammond's numbers inaccurate, unfair, and grossly misleading. Lassiter says the District enrolls 85,000 students. But only a fraction of them are full-timers seeking two-year degrees. Lassiter: The bulk of them are employed. The bulk of them are not enrolled full-time but part-time. Because they're enrolled part-time, it would take them much longer than three years to earn a degree. Lassiter says one group of enrollees seeks a two-year degree. A second group hopes to transfer to a four-year institution. But another large group, with no degree in mind, wants something else. Lassiter: or three, and this is the important area, or three, obtain a workplace credential that would enable them to enter the workforce fully prepared to go to work. Lassiter says there is common ground with the business group. He wants higher graduate rates too. But those rates don't tell the full tale. Texas college and university enrollment grew by nearly 114-thousand students this fall. That's an all time high. Community colleges accounted for much of that for several reasons: tuition costs less, and you can earn degrees faster. But there's also the economy. In this week's KERA's economy segment, Sam Baker talks with Dr. Wright Lassiter, Jr., chancellor of the Dallas County Community College District, about who's showing up for class and why.